WASHINGTON, DC, May 12, 2016, Doreen Christian La Roche, Civil Engineer and Project Manager/COTR for the Operations division of the United States Department of Agriculture, has been recognized by Elite American Engineers for dedication, achievements, and leadership in civil engineering and construction management. Lauded as an expert in construction project management, Ms. La Roche fruitfully utilizes her more than 26 years of professional engineering experience serving a government organization which provides farming services, and enforces agricultural and food production policies. At her current post, she is primarily in charge of managing products which include construction and facility upgrades. Ms. La Roche became involved in her profession after working with the United States Forest Service and USDA’s Office of Operations Engineering Branch. With a wealth of knowledge and experience, Ms. La Roche has garnered a reputation of distinction over the years for her commitment to quality. She has received a number of awards for her outstanding achievements, including Awards for Excellence in Construction Management, and the title of NAPW Woman of the Year in 2012 and 2013. She feels that she has been able to thrive in her field due to an radiant personality. Ms. La Roche pinpoints highlights of her career as her managing new construction for the Caver Center in Beltsville, Md. and the interior renovations of the South Building modernization project in Washington D.C.
Doreen Christian La Roche was originally selected for inclusion in EliteAMERICAN Engineers in May 2013. 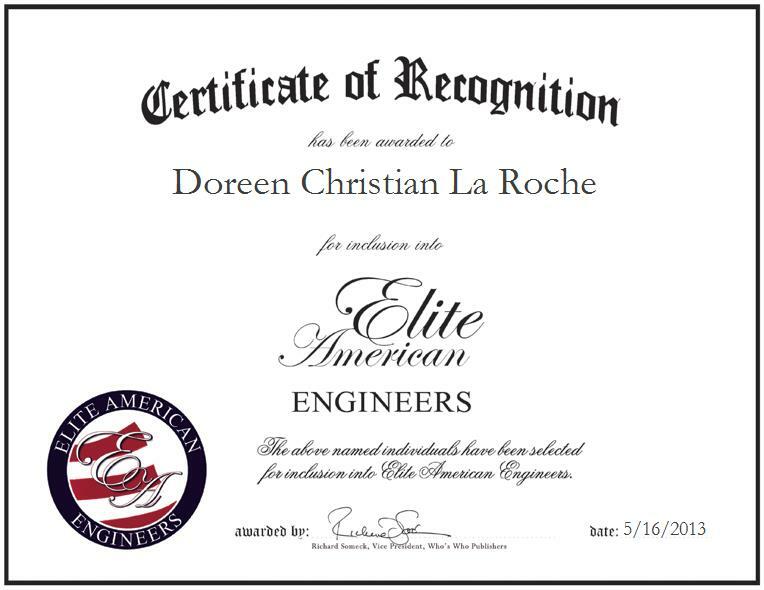 We are proud to be featuring Ms. La Roche again in EliteAMERICAN Engineers for 2016. This entry was posted in Civil Engineering and tagged Civil Engineering, construction management, operations, project management, woman of the year. Bookmark the permalink.